Food and beverage manufacturers have realized the benefits of implementing a sustainability program. In fact, compared to other industries, this industry leads the way in meeting regulations and disclosing carbon emissions information. That’s quite a distinction. But manufacturers are feeling the pressure for even more operational transparency – customers want to know more about the brands they buy, and regulatory agencies want to ensure environmental and social responsibility. A comparison of manufacturing companies listed on the Dow Jones Sustainability Index demonstrates that these companies earned a higher profit margin and outperformed their peers. Another study shows significant stock price increases for organizations that voluntarily announced carbon emission information. In a study on consumer behavior, researchers concluded that sustainability considerations drove or influenced the buying decisions of more than half the shoppers interviewed. Plan – Develop a sustainability and energy management goal roadmap to define goals and targets, and formalize action plans. Do – Implement ISO 50001 quality practices; prioritize and deploy efficiency initiatives; and track metrics for energy, water, waste, and supplier compliance. Check – Monitor efficiency initiatives, reporting measurements and KPIs to track progress. 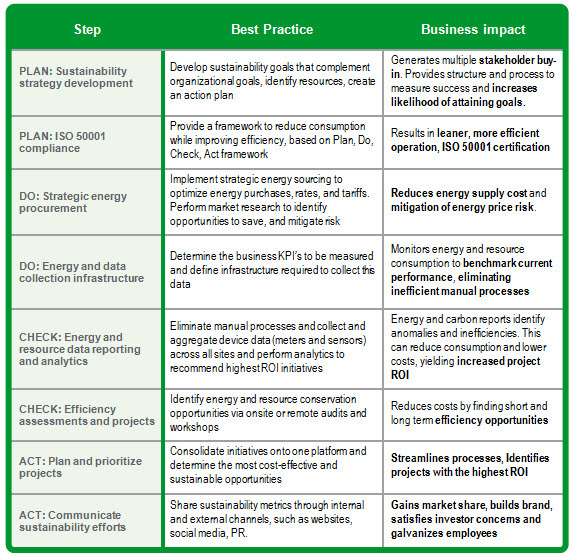 Act – Conduct analysis to determine the cause of any significant differences between actual and planned energy savings results; identify new savings opportunities; share best practices across the organization; and ensure continuous improvement by incorporating energy and sustainability activities into business operations. PDCA best practices emphasize ISO 5001 compliance to blend energy and sustainability management with corporate goals, and they provide a guide to establishing internal processes for continuous improvement. Energy and sustainability management programs mitigate the risk of increasing commodity and energy prices, and a well-executed program can reduce energy costs by 10 to 30%. Sustainability successes help organizations to outperform competitors in an environment characterized by difficult market conditions.